I have been creating wikis with Wikispaces for quite some time. I use wikis for student collaborative projects and I use them during professional development. I use wikis as a place to collect, organize and share content that often originates on a blog post I’ve written. Many of the wiki’s I created years ago have grown with me and continue to support my needs. The blank pages combined with the ability to embed just about anything into a wiki provide me with the flexibility I need to explore new ways to use technology as a tool for learning and to keep track of it. 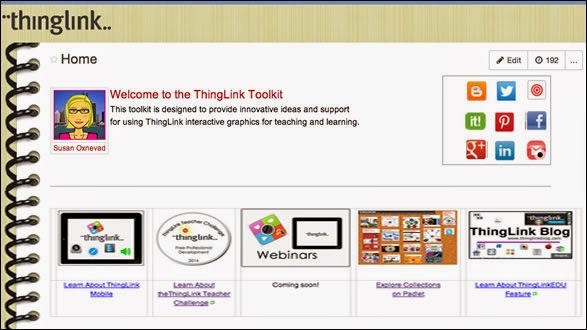 Time has passed, ThingLink has introduced ThingLink for Education and ThingLink for Video, and I have curated a collection of new content and ideas. I was pleasantly surprised to be able to return to the old ThingLink Toolkit, clean it up a bit and begin to organize it in the wiki. I love my Wikispaces workspace!